Episode 137 – Core 2.0 Runner Changes Review! Jesse and his lovable bioroid sidekick Wilfy are joined by their old friend and long-time TWA panellist, Hollis Eacho! The panel dives headfirst into Core 2.0 – what does it mean for the game? Is it a good thing? Is the sky falling? Can you still score/steal agendas without your favourite card that is now no longer available for play *cue tears*? Runner side changes – we run through all of the ins and outs for Anarchs, Criminals and Shapers. Have Anarchs been unfairly targeted with the loss of so many key cards, or will they still rise out of the ashes to play a key role in the metagame going forward? Look out for the second instalment of our Core 2.0 review in the coming weeks, highlighting all of the corp changes and what they mean for the metagame. Hi Alex! Can you tell us a little bit of your experiences with Netrunner, how you started playing, what your first tournament was, and if you have had any strong finishes in the past? Hi Wilfy, hi Jesse, thanks for the opportunity to share some of my thoughts! For those who don’t know me, my name is Alex, I until very recently resided in Adelaide, South Australia, where I started playing Netrunner at the end of 2014. 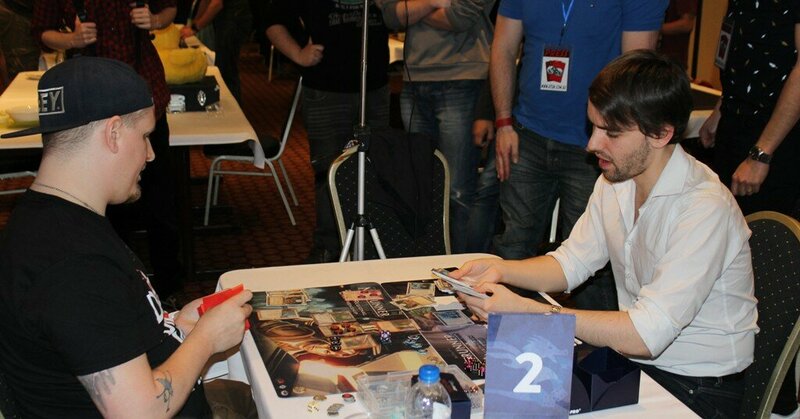 Some of my first Netrunner experiences involved watching Jesse and other great players duking it out in the elimination rounds of the 2014 Worlds event, ultimately taken out by Dan D’Argenio. At the time I primarily played Magic: the Gathering, when a friend who worked at Infinity Games (Adelaide’s most prominent hobby shop) offered to show me how to play Netrunner. I was instantly hooked, and felt that the game offered more depth, and more control over outcomes, than MTG. At my first event I played a simple one core Noise deck coupled with an NBN: Making News list packing Scorched Earth. I was fortunate enough to come away with four wins and two losses on that day, and even more fortunate in coming to know the incredibly friendly and inviting Adelaide Netrunner playgroup. I still remember winning my first Store Championship in March of 2015, running Stealth Andy and a Near Earth Hub fast advance list, and playing against local veteran Damian O’Dea in the final. The first tournament victory that made an impression on me was winning Adelaide’s 2015 Regionals event, where I first had the pleasure of playing against Jesse. After his 2014 Worlds success, and having previously won Adelaide’s 2014 Regionals event, Jesse was no stranger to local players, and I certainly felt I had all the support I could ask for (and some luck to boot) in coming back from the loser’s bracket to beat Jesse twice in the finals to take out the title. The rest of 2015 went well for me, in Netrunner terms, with a top placing after Swiss at Australian Nationals, culminating in a second-place finish on day 2. Alex and eventual 2015 National Champion Darryl Russell duking it out in the 2015 Australian Nationals finals. What was your preparation like for Nationals this year? I have to admit that my preparation was a little lacklustre. The first half of 2017 was hectic for me, which led to my underperforming at Store Championships and Regionals events. With a goal to finish my PhD in August, and with a job lined up to start just after 2017 Nationals requiring relocation to Canberra, going to Nationals was more about rewarding myself for working hard up to that point, before taking on the challenge of starting a new job and life in the ACT. My preparation was therefore limited to playing with the local playgroup, and some jinteki.net testing. Garth Davos, another strong Adelaide player who also came to nationals, kindly offered to put up with me for some more testing, and our play sessions definitely informed some specific card choices I ultimately made. What decks did you end up playing, and how did you arrive at those choices? Specifically, the choice of Replicating Perfection over the more modern Industrial Genomics in a Bio-Ethics lock deck is a little unconventional, so what led you to make the deck choices you did for Nationals? Good question! I’ll start with my Runner deck first, as it wasn’t particularly exciting. I chose Andromeda as my runner as I have had plenty of experience piloting her across a range of builds. I only chose to include Inversificator days before the event, and did not regret it. I also chose to cut Femme for Mammon (this would likely have been Aumakua had I paid more attention to cards within Crimson Dust), and again did not regret it. As for my Corp deck, I did indeed choose Replicating Perfection. Why? Well first of all, I played a 49-card version of an RP Prison deck during the 2017 Adelaide Regionals, and though my runner underperformed, the RP prison archetype carried me to a first place after Swiss, and third place in the cut. After finding out that Crimson Dust would be legal I did briefly test an IG version of the list, but personally found that employee strike and aggressive checking of archives early in the game served as a relatively consistent approach to dismantling the deck. In contrast, the RP deck felt more resilient, as overwriting an Employee Strike with one of two Cerebral Statics I had included in my version of the list had a more immediate impact than might have been the case had I played Industrial Genomics. Beyond this, most card choices, including the move to 54 cards, served to refine the deck’s game plan. Genetics Pavilion and Blacklist, for example, played significant roles in facilitating many of the deck’s victories, and were therefore two-ofs in my version of the prison archetype. What was the tournament like? Did you have any interesting matches in the Swiss? The tournament was great fun, Australian Nationals really is a good time to catch up with people from all over Australia that aren’t just great at Netrunner, but also great people in general. I had no super bye and did not at any point find myself in a position to ID, and therefore played all ten games across the five rounds of swiss. I was fortunate enough with my pairings that my Corp side had mostly comfortable match ups, whereas Andromeda had to contest some intense games against HB Moons, NEH Gauss Rifle, SYNC Boom, Industrial Genomics, and Aginfusion, none of which, win or lose, were easy. Fortunately all of my opponents were polite and also great players, and none of my rounds went to time despite my 54-card Corp deck. Going into the top 8, which was played on day 2, you were 7th – how did the multi-day tournament structure affect your thinking for the top 8, compared to a one-day event? I quite enjoy the multi-day format as it gives players a chance to unwind and celebrate/commiserate on the evening of the first day. As for my thinking about the top 8, knowing who I was facing, the majority of decks in the top 8, and what my likely first match up would be gave me some food for thought, but outside of taking another look at HB Moons lists before play offs began, I didn’t set high expectations for myself. Though some players enjoy that pressure, I personally prefer to be an underdog, though I did believe that if I could somehow come away with a win in my first round against Jian, I’d have a good chance to do well overall. Did you have any interesting matches in the top 8 or any interesting decisions? Fortunately for me, luck was mostly on my side on day 2. Though I still had to avoid losing games that I should win, clean play and patience was generally enough to come away with victory. One decision that did stand out to me as one I was pleased with was in my third game, against Michael Walsh, an excellent player from New Zealand who won the ANZAC Jinteki league, and developed one of the popular versions of the most current HB Moons deck. I think he chose to keep his opening hand, playing a Turtlebacks, into Moons, into Jeeves on turn 1 (possibly in a different order). My opening hand was not amazing, but I felt the need to leverage the lack of HQ ice while taking care of Moons. Therefore after forcing Michael to pop the Estelle Moon I finished my turn by Account Siphoning the Corp, floating tags but having removed Estelle from the board and having gained a considerable financial advantage. After Michael failed to find ice on turn 2, I gambled on finding an agenda in HQ after playing out an Aaron Marron, which in turn let me remove the tags from the previous turn and gain yet a further advantage that carried over into a near unassailable position over the next few turns. How did it feel to have won? That’s a good question, and to be honest winning came more as a relief than anything else. The last game was not one likely to raise cries of jubilation as an incredibly economy light start from finalist Ryan Thomas meant that the RP deck got to execute its plan comfortably before grinding the game out one turn at a time. Though I wasn’t particularly excited at the time, I am definitely giddy with anticipation for Worlds, and all that the Worlds experience is hopefully shaping up to be! After your runner-up result at Australian Nationals 2015 (beating Wilfy in the top 8), you were presumably disappointed – did that change how you approached the game and do you think it contributed to your victory at Nats 2017? After coming second at the 2015 Australian Nationals I didn’t feel too bad. I had done much better than expected, and felt I had played incredibly well throughout the event. Daryl was also a person I was happy to lose to in the final, and I don’t regret taking an early chance to win the final game only to hit I’ve Had Worse with my Traffic Accident. Unfortunately I think my success in 2015 resulted in my placing unreasonable expectations on myself. I did have a good 2016, winning a store champs and the Adelaide Regionals event again, but did not do as well at the 2016 Australian Nationals after feeling pressure to repeat my 2015 success. Not having that pressure on me for 2017, and simply playing the game for the sake of enjoyment and competition improved my Nationals experience, although I am sure winning had something to do with it as well. Do you mostly prefer to play on Jinteki or in real life, and can you share a little bit of your expected Worlds preparation? That is a very good question! I definitely prefer real life, and enjoy a bit of table banter, a bit of bluffing, a bit of everything. A lot of the fun of Netrunner comes from the actual human interaction, and I always try and get some of that going during a game. It’s elevated the game experience to another level for me, and I hope that people who have shared games with me have felt the same way. As for Worlds, I hope to find people also attending Worlds willing to recruit me into their preparation schedule, as having now relocated to the ACT, and having a few extra responsibilities with my new work at the University of Canberra has meant that I have thus far mainly relied on throwing post rotation deck ideas at a jinteki.net wall to see what sticks. A number of people have offered to help me with practice here and there, which will be great, but hopefully I will find a more structured approach involving other likely Worlds participants. Are you excited for Worlds? Have you done a lot of travelling in the past, especially to the US or North America? Have you packed your plucking shoes, and if not, how will you plan to find agendas from HQ? I am incredibly excited for Worlds! Though I have done quite a bit of travelling (and living) in and throughout Europe, this will be my first time in the United States, despite the fact that my mother lives there. I won’t have the time to see much outside of Minnesota, but I plan on taking in as much as I can. I genuinely cannot wait to get into it! As for my plucking shoes, I will have to see if I can find space to pack them, and otherwise I’ll just have to find agendas the old-fashioned way, be it by intuition, or the roll of the dice! Thanks so much for your time, Alex, and congratulations on your victory once again! Thanks again for the chance to talk a bit about Netrunner! I look forward to seeing The Winning Agenda team in Minnesota in just under two months! Wilfy Horig hosts a candid chat with a special guest of many aliases, CrushedGuava/Argh a Snake!/J W Chin, live from a Sydney cafe in the midst of Australian Nationals! Wilfy’s guest was the second seed after Day 1 of the tournament, and he discusses his preparation process for both the swiss rounds and Top 8, including an in-depth analysis of Sydney cafe breakfasts! Wilfy and J W had tested together for the tournament, and they share some of their ideas and experiences from this gruelling process, including which decks they included in their gauntlet and how they settled on the decks they eventually played. This week Wilfy is joined by North American Championships Top 8 Competitor, Weyland lover and wonderful TWA Patreon supporter, Max Williams! Max and Wilfy discuss Max’s performance in the recent regionals season, including the decks he tried out and how they went, as well as their assessment of the metagame. Episode 133 is now live! Wilfy and Jesse dive into the world of Free Mars (bars), with more jokes about martians and chocolate bars than you can shake a stick at! This pack features two new very powerful AI programs, God of War and Maven. The panel talks you takes you through the attributes and shortcomings of each, and how they might best be used to terrorise your opponents’ ICE. Na’Not’K is as close to a green Mimic as we could hope for – will this free up some important influence in Shaper? Bloo Moose, a super new economy engine for runners, offers heaps of options to capitalise on your spent resources! Will you be visiting the ‘Moose? It’s a jam-packed corp side of the pack, with 13 cards to discuss! How does Wilfy rate this pack where 100% of the purple cards are bioroids? Does he have the inside scoop on Loki? Did they go to bioroid daycare together? Obokata Protocol is one of the better agendas to come out recently, and certainly ranks up there with the better 5/3s in the game. When and where does the panel see it being played? “Success” completes the trifecta of fast advance options from the Jemison identity card’s subtitle. How does this triple stack up against Sacrifice and Audacity, and how does it compare to its closest friend, Red Planet Couriers? Is Whampoa Reclamation the new Jackson, or is another card secretly the best Jackson impersonator in this pack? Mass Commercialisation is a very powerful new economy event for all corps. How and when will it be utilised?